Sept. 28, 2018 – We’re in a classical trading / consolidation range and the market seems to be just “watching & waiting” for a reason to go up or down. There is plenty of news to spark things, but we just haven’t seen “The Big One” yet. 8105 is my resistance level (green) and 7976 my support level (red); these are (my version) of Wyckoff “significant bars”. I’ve mentioned before that the low price of a weekly bar that closes much higher on volume is a significant price level of support. That’s where “buying” last came into the market. As is the high price of a weekly bar that closes much lower on volume is a significant resistance level; where “selling” came in. The tricky part is in a consolidation phase where these two levels tighten up and get close to each other. But, my feeling is that we may be in an Up Thrust phase of a Distribution structure; that remains to be confirmed. Let’s not get tooo bearish just yet though. 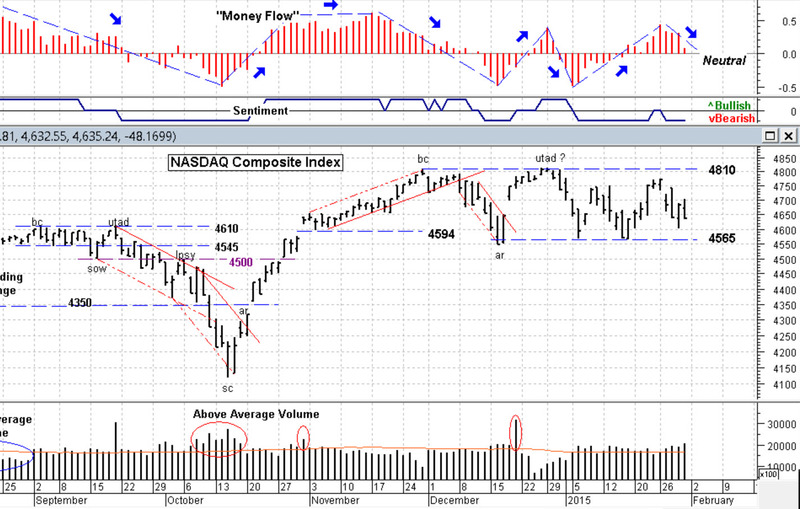 I note market sentiment remains negative, Money Flow a little bearish, Volume Flow just sideways, not saying much. (Short term) Price Strength just kicked up to slightly bullish. Long term trend line channel is up and Short term channel shows a price break above the upper line, which is bullish. The problem with (my) automatic Trend Channel lines is that they need price pivots (swing highs & lows) to reference and draw off of, and in a consolidation, that can take a while to develop. 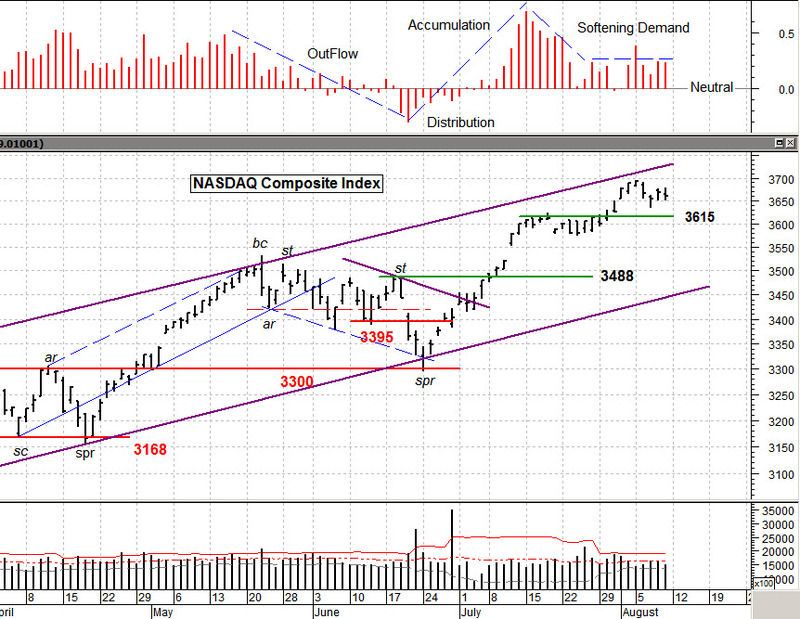 I’m still thinking we could head lower to around 7700 on the NASDAQ Composite Index. Biotech, HealthCare, Energy (oil) and a very few Technology companies are showing up in my stock scans. Japan has been doing well and I’m watching Latin America as well. China is a rollercoaster for the time being. Well, there’s not much else to cover. I do have positions on but also a light hedge” just in case. I’ll put more hedge on or remove it when this market gives me a better indication of direction. One thing to gauge the market strength is how it reacts to news (either good or bad). I learned that a long time ago taking a course from Michael Price. (“Strong markets don’t react much to bad news, where Weak markets fall hard”.) It will be interesting to see how this market reacts in the coming weeks. Take Care, Good Trading and have a good week. …. Tom …..
July 20, 2018 – I’m seeing the early stages of Caution beginning here. 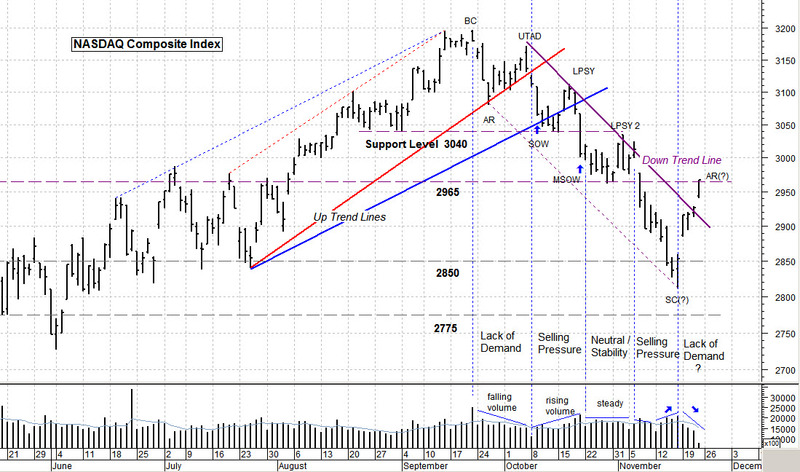 No “Red Flags”, but just a “Heads Up” to pay extra attention to market action this week. The reasons are: lethargic Money Flow and the recent price / volume action. Looking at the chart below I note narrow range bars (red ellipse; buying=selling demand) and very low volume (red arrow; much below the red 20 day average line). Is this just a pause where there is equilibrium and hence little movement or is it Lack of Demand? Either is possible but the classical chart pattern is a “Coil”, where prices go nowhere in a tight range only to breakout suddenly in one direction or another. Personally, I’m favoring a Lack of Demand, which means a soft / lower market. But as we’ve seen, any news item could break this equilibrium effect. 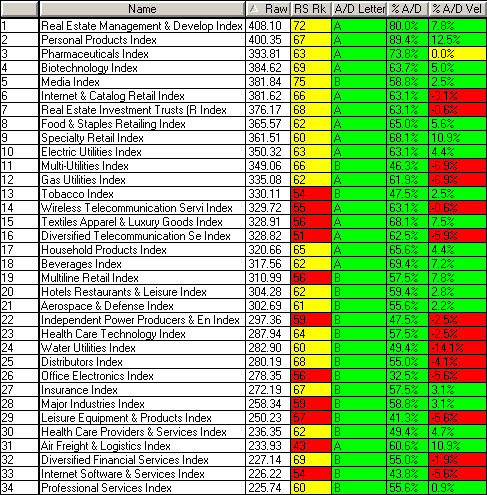 The table below shows what sectors are doing in the short term; what to favor and what to avoid right now. I’m waiting for the market to move and IF it goes lower I won’t wait to lighten up my longs. A touch below 7746 would concern me, likely back to a light hedge for protection. That’s it for now. Perhaps the “Summer Doldrums” have set in; or not. Just a word of Caution for now. Have a good week. ….. Tom ….. Please see my monthly client report under the ‘newsletter’ tab for more information, but from the chart below it’s easy to see that we remain in a trading range. Back and forth we go until some item drives investors to make a commitment either up or down. Earnings are mixed with about as many positive surprises as negative ones. Market Sentiment (note chart above) remains weak. There just does not seem to be a willingness to commit right now. Technically we’re in a “likely” re-accumulation phase and that could last quite awhile but . . . there is always a possibility of a nasty surprise to the downside (note last September). It would appear that a significant negative economic piece of news could spark a sell off (Greece and the EU conflict? ), but it’s hard to predict that. Looking at “Money Flow” for the S&P 1500 component stocks (below) there just isn’t that commitment to buying. And so we remain within a range for now. There is general strength in more defensive sectors and select opportunities in semiconductors, biotech and healthcare, but very select. Keep a close eye on things, as they can change very quickly. Honor those stops. I was (not really) surprised when the “talking heads” on the financial media began talking about this being the first week in the last 6 that was a “down week”. Really? And did we all expect each and every week to be an “up week” in a Bull market (or a “down week” in a Bear)? Of course not. This year has really spoiled us into thinking the trend must continue day after day, week after week, but it doesn’t. A quick look at the chart shows that we’re (still) toward the upper end of the price channel (purple). That’s were advances slow down and this week it did; that’s all. As I mentioned in previous posts, I expect the rest of the Summer to be volatile with little hint of the markets next real move. I think we may just have to wait until after Labor Day. Richard Wyckoff (i believe) would call this action “stair steps”, which are nothing more than consolidation periods within an overall move. Volume (supply of shares) is light and the daily spread of the price bar is rather narrow. Not much action . . . . vacation time perhaps. 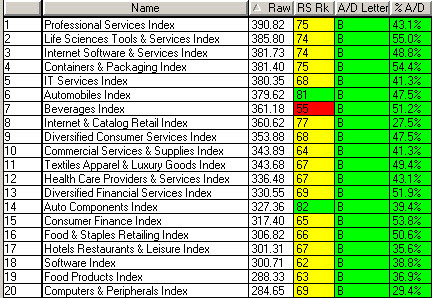 Above we see the top sectors ranked by recent strength. These are the top 20 sectors out of a possible 68 sectors. Hopefully your portfolio represents most of these as it looks like a stock pickers environment. That is, the market may be slowing with a consolidation pattern but there are stocks that are moving ahead. I also note that for most of this year the Russell 2000 Index (small capital stocks) have been the strongest (i.e. “risk on” trade), but recently the NASDAQ 100 Index has moved to the top. Perhaps large cap tech stocks are finally beginning to show some strength. Something to watch. That’s about it for now. Not much exciting to discuss. Enjoy the Summer but remain vigilant. . . . . . Tom . . . . .
price chart courtesy of MetaStock; sector table by http://www.HighGrowthStock.com; used with permission; click on graphics to enlarge. In reference to last weeks posting, as to being on the cusp of a trend reversal; well we were close but the week past pulled the market back from the brink. As the chart below shows, I’m still watching the 3168 support level (red line) and I’ve spotted in a new upward trend channel (blue lines). Have a good week (it’s nice to be back working with a fast computer and a big screen). 🙂 ….. Tom ….. I remember an old trader asking me “Where’s the risk, at the top of the market or the bottom?”. I had to think about this . . . surely if the market has fallen very much it’s in terrible shape, but then again . . .
Last week I talked about many of the indicators that were bordering on euphoria. Heck, darn near everything was up ! And this week was great, right? 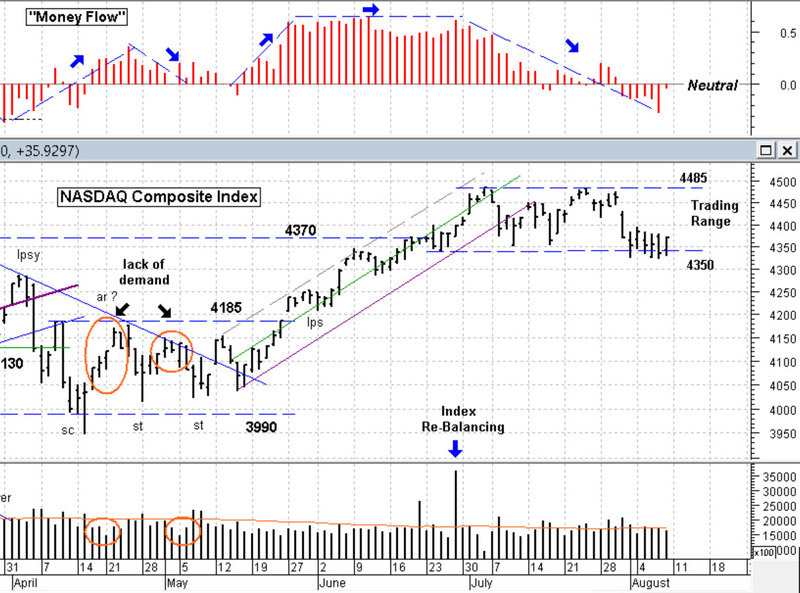 In the 4 day trading week that ended 1/25/13: S&P 500: +0.71%; NASDAQ Composite: +0.21%. What concerns me is the press that this rally is getting in the TV and radio media: “Stock Market at Multi-Year High” , “401k’s Gaining Back There Losses!”. OK that’s factual right but we need to see what this market does during some type of correction (lower prices). That will be a good indicator as to whether this market rally “has any legs”. What should we be looking at? A few things. 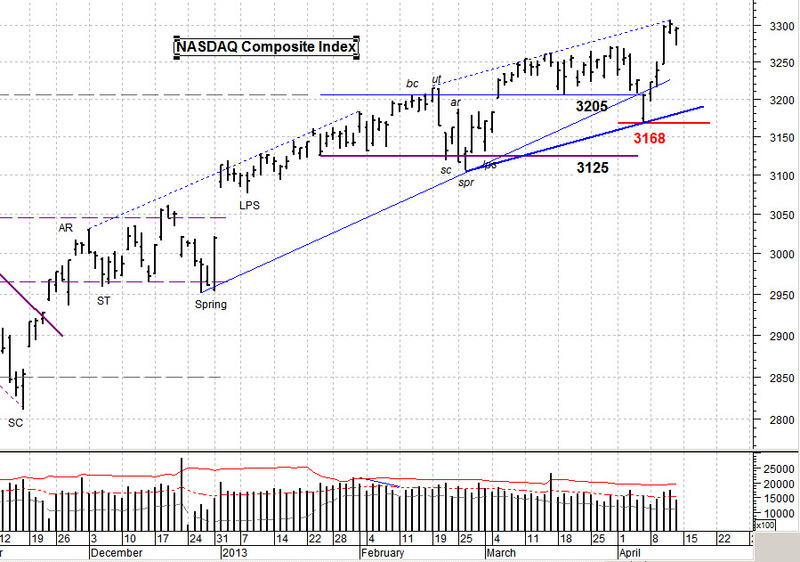 I spotted in my current Support level for the NASDAQ Index at (about) 3076. Lower than this gets my attention. Also a few price channels. Line ‘A’ would indicate a minor pullback if it holds; “no worries” here. Line ‘B’ is what I feel is a likely scenario and raises my antenna a bit more, tho the 3076 level is also important. Breaking the heavy line ‘C’ would likely mean a change in character for this market. At that point my exit prices for my stocks have likely been hit and I could be slightly net Short the market. I’m not predicting here . . . just concerned. Note the red down arrow at the top of the price range; it is a narrow range bar with the open and closing prices nearly the same. If the volume on the bar was abnormally high . . . I would MUCH more concerned. But it’s not (that’s good). So don’t worry about Apple, it’s too late. The smart money is waiting for it to form a base then thrust it down one more time before they buy it again. The idea is to scare the Hell out of the weak hands (if they haven’t been already). The risk was at the $700 level, it has lessened at the $440 level. But “Wait for It”. First off, may I wish all of my readers a very Happy New Year. May 2013 bring you and your family Health and Happiness. This post will be short since we had a shortened week and I’m involved with a research project and need finalize the overall project outline. Last Friday I was thinking we could have a Last Point of Support (LPS) with a strong up bar on very high volume. Supply was definitely coming into the market and the strong Close made me give pause. Well, it did not happen. From the chart below we note that the market last week closed below the Low of at bar (circled in red) and continued lower. Bad news? 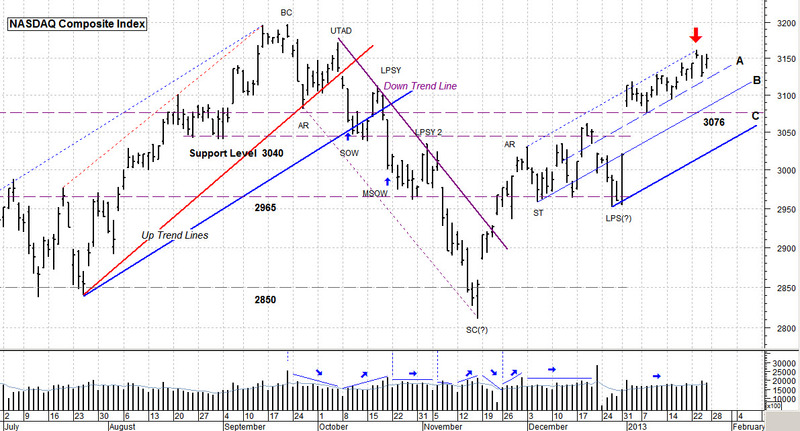 Well not really as we’ve just stayed within the trading range between 3045 at the top and 2965 at the bottom. The market can’t make up its mind about where to go next so it enters a congestion phase. The whole “fiscal cliff” political wrangling continues and that causes folks to try to figure out which way the next market move will go. 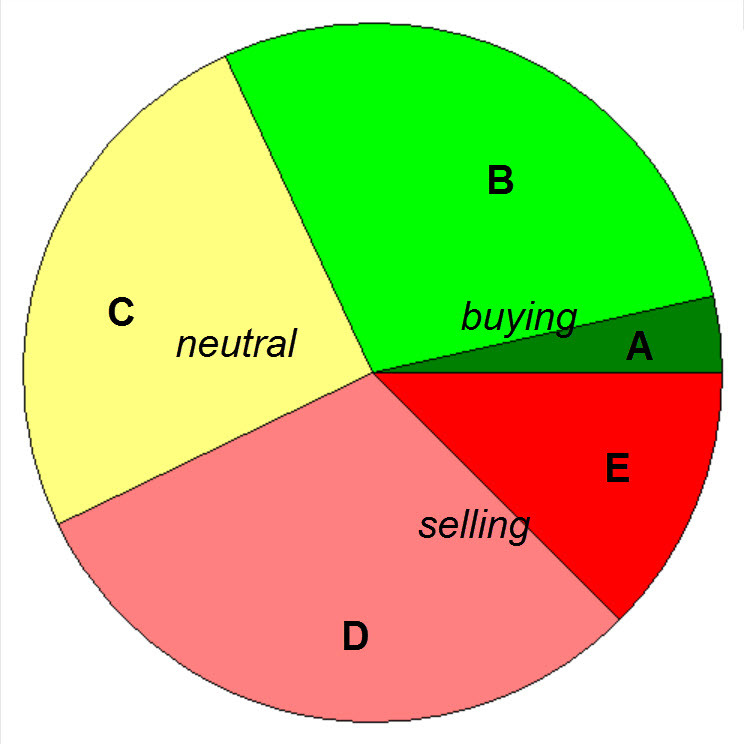 One hint is the pie chart below showing the number of stocks in the S&P 1500 index that are in stages of Accumulation (money flowing in, Distribution (money flowing out) and just Neutral. It doesn’t look like very many are expecting “all Hell to break loose”, so I’d say the street is expecting some sort of resolution in a positive direction. We’ve seen a fair amount of tax selling because people holding profitable stocks can (likely) pay lower taxes this year than next. They eccentually “reset” their Capital Gains clock by selling now and buying back after the first of the year. Also we may see some tax selling early next year to take advantage of stock loses against those (likely) higher taxes next year. But . . . at this point no one really knows what (or if) any deal will happen. And so it goes. charts courtesy of MetaStock and www.HighGrowthStock.com ; used with permission; click on chart to enlarge it. Kids often hear “Just wait until your Father comes home ! (implied: “You’re going to get it !”), and that’s what this shortened week feels like. Basically just 3 days long (Friday was a half day) and many market active groups were on vacation, so it’s hard to draw much if any conclusions. This posting will be a short one but let’s quickly take a look at this market . . .
What I see is possibly a Sell Climax (SC) followed by an Automatic Rally (AR), which is stopped for the time being at a previous support level of 2565 on the NASDAQ Index. Next weeks action will confirm or reject that idea so we must “Just Wait Untill . . .” Maybe we’ll “Get It” or maybe we won’t. Unfortunately the Volume does not help to confirm much of anything. It was light all this week which would indicate a Lack of Demand, but that could just be the Thanksgiving Holiday talking. What sectors are strong in the near term? 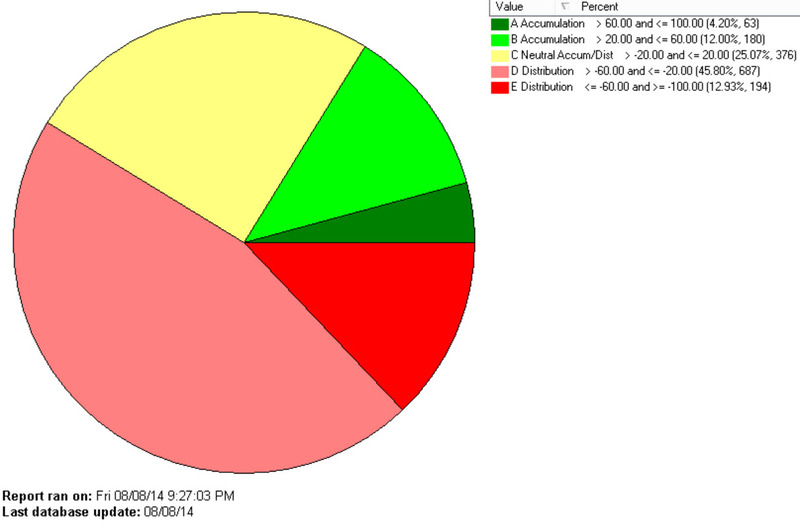 Out of the 68 sectors the Top Ten are shown below. Note A/D stands for Accumulation/Distribution (A thru E ranked), a money flow indicator and RS stands for Relative Strength (1 to 100 ranked), how strong this sector is relative to the S&P 500 Index (compared).